It’s been pretty hard to skip through any Seattle TV news broadcasts lately without hearing all about the devastation that Washington’s largest city and its outlying areas are feeling from drug wars. Reports on crack houses and citizens under gang-related fire are nightly occurrences as the home of the Space Needle gradually edges towards a reputation as L.A. North. There’s a goodly amount of tough, angry riffs on Facelift’s 12 tunes, half of which were penned by Cantrell himself. Most of them will be in evidence at the Town Pump on Friday (January 11) when Alice in Chains makes its first pilgrimage to this fair city. The band has come a long way since its days of scraping by while living in a 50-room rehearsal hall in Ballard. Cantrell says that his band feels an affinity to the mass of Northwest bands struggling for record deals, and claims that, venue-wise, Seattle isn’t a great place for original acts these days. 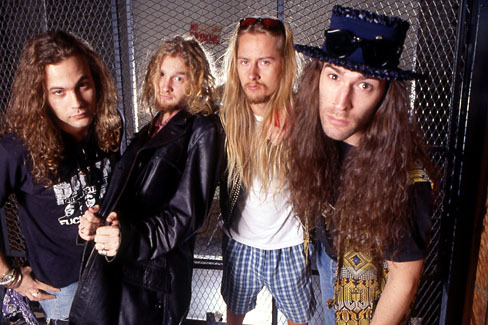 But Alice in Chains was one of the fortunate Seattle-based bands to score a major label deal quite fast, signing a contract after just two years together.